Tony Blair is going to talk to senior colleagues about the details of the "stable and orderly" transfer of power, Chancellor Gordon Brown has said. But Mr Brown, widely tipped as the next prime minister, told GMTV Mr Blair had not yet discussed timings with him. The government had to prove by "actions and behaviour" that it was capable of winning people's trust, he said. Deputy Prime Minister John Prescott also warned Labour MPs "not to get into a war about" the party's future now. The comments came as a poll for the Times newspaper suggests that Labour has slumped six points in a month to 30% - its lowest level since 1992. The Populus poll put David Cameron's Conservatives on 38% and the Sir Menzies Campbell's Liberal Democrats on 20%. On Monday night Mr Blair assured Labour backbenchers that he would give his successor "ample" time to bed in before the next general election - which is expected in 2009 and must come before May 2010. 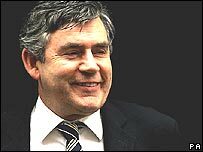 Mr Brown told GMTV he was sure that Labour could "prove to the world that we can do these things in a unified and proper way". "You know there is no leader who has said before he is going to leave before an election, so undoubtedly there's speculation about what's going to happen," he said. "Tony Blair said last night that he was going to organise it in a stable and orderly way." Mr Brown said he accepted that he was Mr Blair's chosen heir: "He did say that." Pressed about whether his coversations with Mr Blair had included details of his succession, Mr Brown said: "No... I think what he's going to do is talk to senior colleagues about it." Mr Brown insisted that the succession was "a matter not just for me, it's a matter for him and the Labour Party". He said that over the last 100 years in politics, successions have always been "disorderly". "The task ahead of us is to build again this New Labour coalition, to persuade people who voted for us, particularly at our highest point in 2001, that we can answer the challenges ahead," he said. Labour had to show people it could provide economic prosperity, police on the streets and protection against terrorism, so that people could feel secure in their homes, he said. "We have got to prove, by our actions and our behaviour, and also by the measures and policies we take that we are capable of enjoying the trust of the British people, that people can have confidence in us and that people believe that we can take this country forward." Meanwhile, Mr Prescott urged Labour backbenchers to work towards the goal of a smooth and orderly transition of power from Mr Blair. Giving a clear warning to hold off until this year's party conference in October, he added: "Whatever the feelings about this and conference, I do say to people, don't get into a war about it now. It's an unnecessary distraction." He also told the Independent newspaper he had been "stupid" to have an affair with his secretary Tracey Temple. Populus interviewed 1,509 people aged over 18 by telephone between 5 May and 7 May. That's Tony Blair's message, but will it be enough to convince Labour critics?